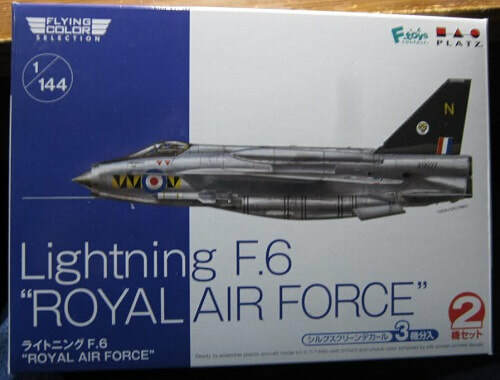 In Box Review of Platz/F-toys Confect 1/144th Scale Lightning F.6 "Royal Air Force"
The English Electric “Lightning” is a supersonic jet fighter aircraft of the Cold War era, noted for its great speed and unpainted metal exterior finish. It is the only all-British Mach 2 fighter aircraft and was the first aircraft in the world capable of supercruise. The “Lightning” was renowned for its capabilities as an interceptor; pilots commonly described it as “being saddled to a skyrocket”. Following English Electric's integration into the unified British Aircraft Corporation, the aircraft was marketed as the BAC “Lightning”. 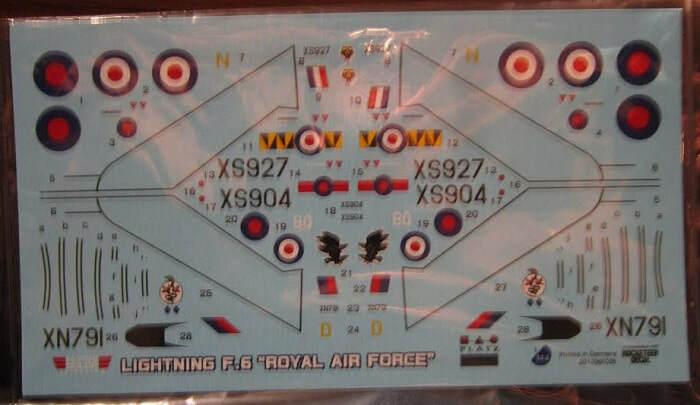 The “Lightning” was prominently used by the Royal Air Force RAF and the Royal Saudi Air Force. The aircraft was a regular performer at airshows, it is one of the highest-performance aircraft ever used in formation aerobatics. Following retirement in the late 1980's, many of the remaining aircraft became museum exhibits; until 2010, three examples were kept flying at “Thunder City”" in Cape Town, South Africa. In September 2008, the Institution of Mechanical Engineers conferred on the “Lightning” its “Engineering Heritage Award” at a ceremony at BAE Systems' site at Warton Aerodrome. Platz is a model company based in Shizuoka City, Japan. I do not know who F-toys Confect is?? I suspect that this company worked in cooperation with Platz on this model kit. F-toy's name is on the box art next to Platz's. On Platz's web site they say that in addition to manufacturing and selling their own products (plastic models, decals, etched parts etc). 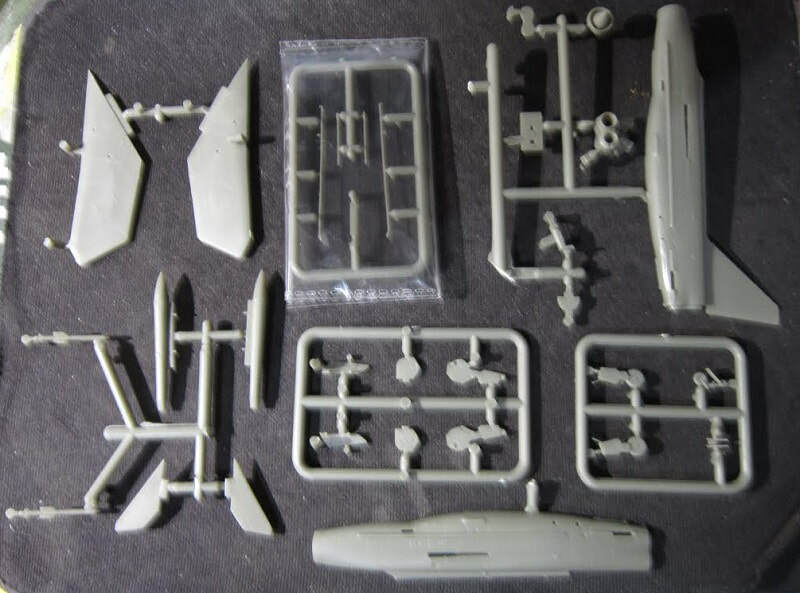 they also are an authorized import agent, selling products from world-famous plastic model makers (airplanes, tanks, figures etc.). The kit comes in a end opening type box. I am no fan of this type of box, because invariably parts or the decal sheet find their way past an end flap to become lost forever. Give me a tray and lid type box any day of the week. The box contains 2 complete kits but is blousy and there is a 2" void in its width. The box art shows a Lightning F.6 posed against a background that is 1/2 white and 1/2 blue. The aircraft is overall pale-grey, with a black anti-glare panel in front of the windscreen and a black rudder. The RAF roundel below the cockpit is on bars that are black and yellow tiger stripes. There is a white circle on the rudder with a tiger's head on it. A yellow "N" is high on the rudder. It carries a small black fuselage number XS927. It is an aircraft with RAF 74 Squadron. 1. The box art subject (already described). 2. A Lightning F.6 with RAF 11 Squadron. It is medium-grey with a green wave pattern over a light-grey undercarraige. It has the black fuselage number XS904. There is a white BQ hight on the rudder above a logo of 2 black birds in flight. 3. A Lightning F.2A with RAF 92 Squadron. It is green over a light-grey undercarriage. It has a logo of a white circle on the rudder with a undercarriage image on it. There is a yellow "D" high on the rudder. 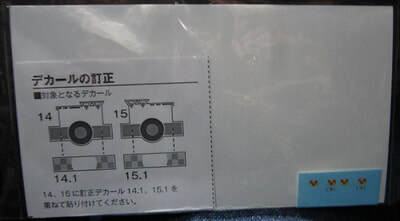 ​One side panel of the box has features of the kit in Japanese, English and French: "This is a platic unassembled scale model kit. Glue and paint are not included. Some parts are extremely sharp, handle carefully. Do not use near fire while using glue or paint. Suitable for age 15 and above". The copyright of 2017 is shown, above MADE IN JAPAN and Platz Co. Ltd's. street address in Shizuoka City, Japan is shown as well as their telephone and FAX numbers. The other side panel has small color profiles of the Lightnings from RAF 11 & RAF 92 Squadrons, followed by a paragraph in Japanese that I suspect is the aircraft's history. 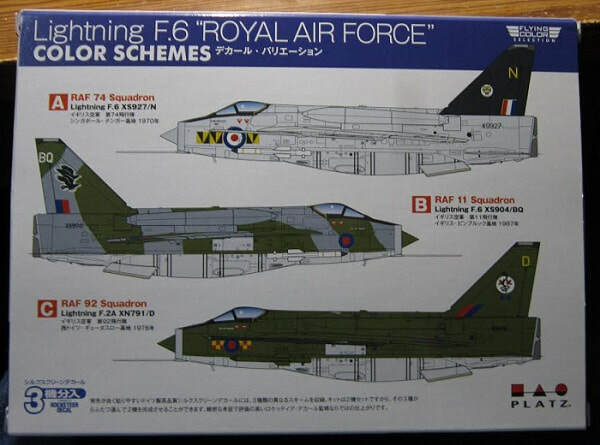 As said earlier, this kit contains 2 complete Lightning models. Both kits are in re-sealable cello bags. 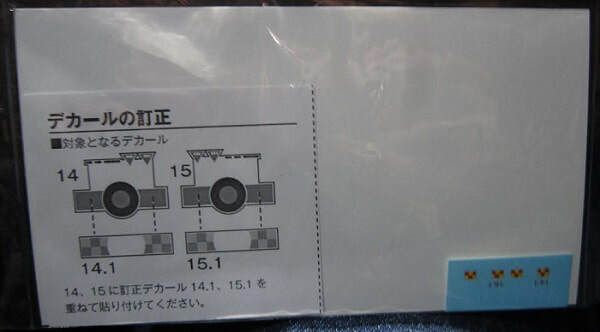 There are 5 dark-green trees of parts and 3 loose dark-green parts, a clear tree, 2 decal sheets and the instructions. The instructions consist of a single sheet printed on both sides on slick-coated paper. It is folded twice to fit the box. The face side starts with a repeat of the kit's features, over 4 assembly steps and the parts trees illustrations. Platz's street address, telephone and FAX numbers are repeated at the bottom of the sheet. The other side of the sheet has assembly no. 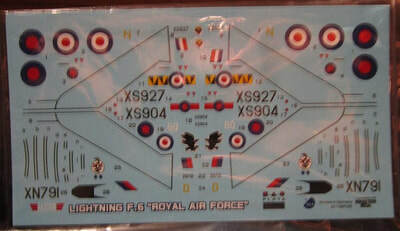 5 used as the painting and marking guide with 4-views of the 3 Lightnings already described above. A suggested paint color listing of Mr. Color and Model Master brand paints is shown, with the 6th assembly step below it. The parts trees are not alphabetized, nor do the trees have number tabs next to the parts. This means constant study of the instructions to get the correct parts for each assembly. ​The second dark green tree holds: the nose wheel compartment doors, probes and antennas etc. (4 parts) This tree is in its own sealed cello bag. Loose dark green parts are the wings and the other fuselage half. 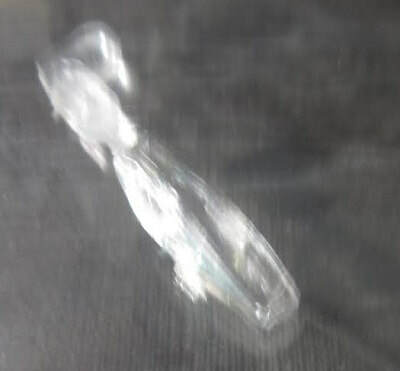 ​The clear canopy part is just one part. It is in its own sealed cello bag. ​This is a nicely detailed kit for it's small scale and nice to get 2 full models in the box too.